Black Elk is the definitive biographical account of a figure whose dramatic life converged with some of the most momentous events in the history of the American West. Born in an era of rising violence between the Sioux, white settlers, and U.S. government troops, Black Elk killed his first man at the Little Bighorn, witnessed the death of his second cousin Crazy Horse, and traveled to Europe with Buffalo Bill’s Wild West show. Upon his return, he was swept up in the traditionalist Ghost Dance movement and shaken by the Massacre at Wounded Knee. But Black Elk was not a warrior, instead accepting the path of a healer and holy man, motivated by a powerful prophetic vision that he struggled to understand. 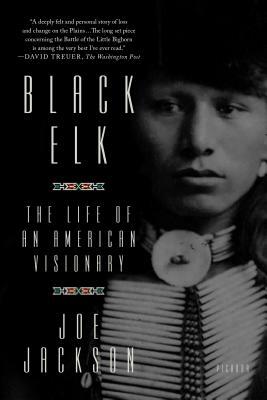 In Black Elk, Joe Jackson has crafted a true American epic, restoring to its subject the richness of his times and gorgeously portraying a life of heroism and tragedy, adaptation and endurance, in an era of permanent crisis on the Great Plains. Joe Jackson is the author of several books. The Thief at the End of the World: Rubber, Power, and the Seeds of Empire, was named one of Time magazine’s Top Ten Nonfiction Books of 2008. "With access to family members of Lakota spiritual leader Black Elk, investigative journalist-historian Joe Jackson's talents as a writer, interviewer and historian are all on full-display in Black Elk, the most evocative, empathetic and comprehensive biography ever written about the Sioux holy man." —True West magazine, "The Best of the West"
"Now readers can rediscover the real Black Elk and the wise, haunted book that bears his name. Jackson’s biography . . . brings long-lost events into sharp focus, both before and after the birth of what Jackson calls ‘one of the twentieth century’s most important documents on Native American culture’ . . . A timely addition to a rich and troubled history." —Gregory McNamee, Kirkus Reviews "Interviews and Profiles"